It provides high reliablity and strong performance and very good accuracy. Textured grip and authentic engravings on grip and slide. Functional decocking lever and realistic double action trigger. Removable metal full size magazine. Things I liked: This is a replica just like I carry so it's great to work with it fits the same holster I use. Being all metal and blow back is great. Just like the real thing. Things I would have changed: Not a thing maybe add an extra magazine at no charge for a special deal. What others should know: If you want something that's close to the real deal definitely go with full metal blow back, great to practice with. Things I liked: Weight of the gun accuracy and trigger pressure. Things I liked: the size of the p229 is perfect. the grips have a good feel making it very comfortable and easy to shoot. 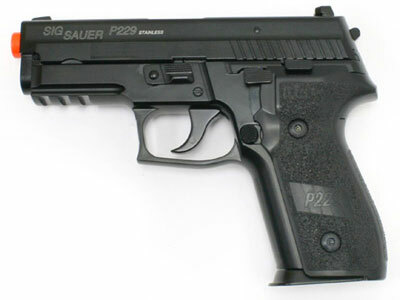 the decocker works exactly as on the real p229. great accuracy even out to 125 feet. double action trigger pull very good and excellant in single action. nice three dot sights. pistol breaks down very easily for cleaning just like the real sig sauers. nice compact pistol to have as a backup. get spare magazines for even more fun shooting. the trigger guard on the sig is good aid in sighting in on targets. a must have for any sig lovers. extremely accurate right out of the box. Things I would have changed: making the lower frame out of polymer so the weight could be reduced a little, other wise absolutely nothing. Could one buy a co2 magazine for this gun? 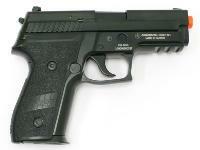 This is a green gas only pistol.